In New York in 1877, Angela Bellini longs to become a concert violinist and get away from her abusive father. When her dream takes her to Greeley, Colorado, to purchase a violin from a master instrument maker, she learns she must wait three weeks until her violin is ready before she can head home. Angela is determined not to let anything or anyone waylay her dream, but when she meets rough-and-tumble cowboy Brett Hendricks, her heart is torn. He is her opposite in every way—uncouth, cocky, and reckless. But she is hopelessly drawn to him, like a moth to flame. Brett Hendricks is on the run—not just from an angry rancher who is tracking him down for shooting his son but from a dark and troubled past plaguing him with guilt and shame. A wild, untamable cowboy, Brett can break any horse with a soft touch and soothing word, but nothing in the world can bring him peace. He fears he will never stop running, never see his dreams of ranching realized. But then, one evening, he hears sweet violin music that seeps deep into his soul–music that floods him with peace. He falls hard for Angela but knows she plans to leave Colorado. All his attempts to win her heart fail disastrously, and though he buries himself in the cattle roundup, when he helps thwart a rustling outfit, his enemies multiply. Somehow he must find a way to gain Angela’s heart and trust. And somehow Angela must break past her distrust of men to discover the love awaiting her with open arms. 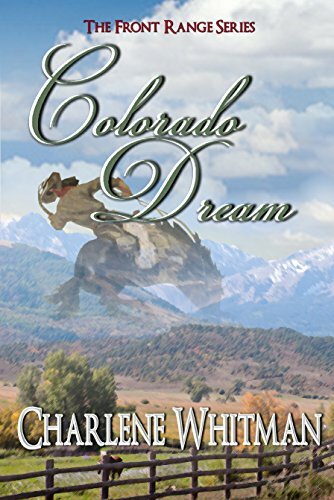 Colorado Dream is the fourth installment in The Front Range Series of sweet historical Western romance novels by Charlene Whitman. The novels in The Front Range Series of sweet historical Western romance can be read in any order. Immerse yourself in the world of Charlene Whitman’s characters, set in the Wild West in the 1870s—sweet heart-thumping romance that will inspire, uplift, and send your spirit soaring.